I have been cooped up in the house for an entire week with my sick and injured little girl, so all I’ve dreamed about is redoing my living room and summer. Ha! 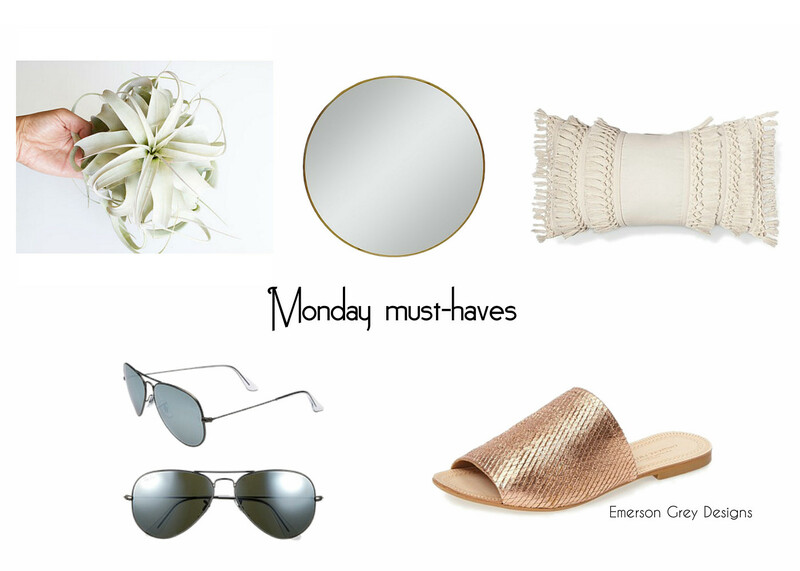 So this weeks must-haves are some great pieces for anyone’s abode and a little bit of what I’m digging for spring and summer. Every home needs plants in it…every! If you don’t have any currently, now is the time to go shopping. Not only are plants great for your air quality, but they also add such a liveliness to any space. I love a big air plant and am for sure going to grab one of these for myself. Another piece you all need in your home is mirrors. They add reflection and when you use round mirrors they add such movement. This is my go to mirror from Target. I am crushing on this new fringe pillow I grabbed from Target the other day that was included in the new launch of decor items. There is some really great black and white items rocking it at Target right now. I’m back loving aviator sunglasses after not wearing them for about a year. There is just something about a big wire frame and mirrored lens. Even if you are just rocking a simple tee and ripped jeans, aviators take that outfit up a notch. I love me a cute slide sandal for warm weather and I just love how these from Kristin Cavallari have just a little bit of a heel and I love the striated pattern and metallic touch.